Haven’t decided on a hotel yet? You can look at other available hotels in the Champagne region with Booking.com. 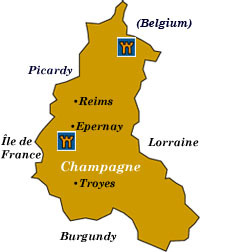 Bearing the name of that eponymous golden elixir, the Champagne region has cultivated grapes for some 2000 years. Brilliant carpets of vineyards cover much of this agricultural region, worthy of several days of exploration. Look past the grand maisons and dozens of small, family-run cellars, and you’ll soon discover why Champagne was one of the most prosperous regions in the Middle Ages. Once at the crossroads of northern Europe’s trade routes, precious half-timbered merchant houses, magnificent cathedrals, and mighty fortresses still survive for the 21st-century traveler to visit. Champagne also offers a good cross-section of accommodations in castle hotels. You’ll find everything from rooms in Europe’s largest fortress to a castle where Louis XVI and Marie Antoinette took refuge on their flight to Varennes during the French Revolution. Reims Known even in Roman times, Reims witnessed the coronation of twenty-five French kings over the course of a thousand years. The magnificent churches and palace of Reims are UNESCO World Heritage Sites. Its glorious Gothic Cathédral Notre Dame replaced even an older cathedral where Clovis was baptized in 498. Across town, the 11th-century Basilique St-Rémi is the largest Romanesque church in northern France. Kings about to be crowned would spend their final night in the 17th-century Palais du Tau. Today you can visit the kings’ banqueting hall and a museum. Art lovers will want to stop by the Musée des Beaux Arts to have a look at David’s Death of Marat as well as the largest collection of Corot’s landscapes outside the Louvre. The Champagne Houses Every day is a good day to celebrate, and where better than in the cellars of the champagne maisons. Moët & Chandon, Mumm, Taittinger, and Veuve Clicquot-Ponsardin are among the most famous that are open for visits (reservations often required), but don’t pass up the smaller, family-run firms. Your hotel will have suggestions. Troyes Step back and discover what Europe looked like in the Renaissance age. Charming timber-framed 16th-century houses look over cobbled lanes in this historic capital of the counts of Champagne. A cathedral, basilica, and Gothic churches have a special atmospheric appeal.